The Lenovo Phab 2 Pro is an incredibly powerful smartphone that maps and understands the world around you thanks to its four cameras. Like a window into an alternate dimension, its screen can fill your room with virtual objects by augmenting reality. Or you can place dreamed-up furniture ideas into the room and faithfully measure. Yet it isn't equipped with the best Qualcomm processor. "What the deal?" was the more sanitized version of commenters' reactions during our Lenovo Tech World coverage. They have a valid point, though. This is an otherwise souped-up phone. A Snapdragon 652 System-on-a-Chip (SoC) is okay for the first Project Tango phone - it's able to pull off Google's depth-calculating, augmented reality vision on a super-sized Quad HD handset. But when will the ambitious Tango tools step up to the flagship-level Snapdragon 820? After all, it's a popular (and proven) processor used in just about every major Android phone in 2016, including HTC 10, LG G5 and our best phones list-topping Samsung Galaxy S7 Edge (well, the US version). I posed the question to Seshu Madhavapeddy, Qualcomm's Vice President of Mobile Computing and found out: how about starting today? Qualcomm is opening up the Snapdragon 820 and future 800 series chips to Tango, he told me, so I further explored what that means, just in case you had more "What's the deal?" questions. Why start with Snapdragon 652? It unsurprisingly comes down to cost and, more surprisingly, the specs needed to run Tango on the Lenovo Phab 2 Pro. Snapdragon 652 was seen as the right answer for both. "The decision was to select the right chip for the right product," said Madhavapeddy, who worked with Google and Lenovo for 18 months on this Project Tango phone. "It fit the overall cost structure to make this a $499 (around £374, AU$673) device." 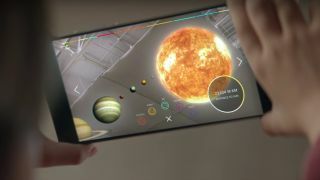 He also called the Snapdragon 652 "more than adequate to support Tango," running through the specs behind Lenovo's phone: It supports that massive 6.4-inch Quad HD display, and doesn't necessarily need the Snapdragon 820, which can handle 4K displays. Another point: the Snapdragon 820 would lend itself to more efficient battery life savings given its smaller 14nm chip size, but the Phab 2 Pro already comes with a hulking 4,050mAh battery. The power savings are less relevant. He put it this way for concerned commenters: Snapdragon 652 is a high-end chipset, just not Qualcomm's highest, labeling it "by no means lightweight." It's just one level below the 820, which itself "sits in a class by itself [versus the competition]." Still holding out for a Snapdragon 820-equipped Tango phone? None have been announced just yet, but fret not, Qualcomm opened up its superior chipset to all Tango phone manufacturers. Tango is therefore ready for the next best Android phones with the inclusion of the 800 series chipset, and as you might expect, there are going to be big battery savings and smaller form factor benefits. "We're able to run every single piece of software that Tango requires with less than 2 watts of power on Snapdragon 652," noted Madhavapeddy. "That's even going to go lower with 14nm chipsets, such as Snapdragon 820." Power savings in future Project Tango phones means that the smartphone can get away with shrinking down to smaller battery sizes and expanding to 4K displays in the future. A few commenters saw the benefits of an immersive 6.4-inch display on a Project Tango phone, especially with AR involved, but most felt it would be a detriment to their pants pockets. Phablets are hard enough to fit; this is basically a tablet at that size. "The implementation of Tango on our processor clearly points to there's no barrier to being able to insert this technology into smaller form factors," said Madhavapeddy. "Of course, there is the aspect of mechanical design, because you are adding additional sensors. But as you can see, on the back of the Phab 2 Pro, there's plenty of real estate there. It's entirely possible to pack these sensors into a smaller form factor." Finally, the Snapdragon 820 is said to be uncompromised by its Tango attributes thanks to the fact that it contains six processors and five sensors, which handle their respective tasks and free up the normally taxed CPU. Besides the usual gyroscope and accelerometer, the Snapdragon architecture includes ways to measure the world with a fisheye camera, rear RGB camera and depth camera, then report back to the various processors, all without putting too much of a tax on the CPU. Project Tango combined with Google Daydream? Madhavapeddy talked about the immersiveness of the 6.4-inch Lenovo Phab 2 Pro, so I asked him about the possibility of Project Tango phones being used in a virtual reality headsets, maybe one with incredible AR capabilities. "I think there's a fairly good chance that it's likely to happen," he revealed before going into a Google Daydream re-cap. "Now if that [Daydream] smartphone also has Tango, you have one that has both." Madhavapeddy said he couldn't talk about the Daydream capabilities of Project Tango phones planned for the future, but he did say, "Certainly there will be other products. Stay tuned." That sounds like a promising combination that could legitimize both platforms in their infancy.